Attendees of the PowerMEMS 2009 conference have a look at the research being conducted in the FabLab, part of the Maryland NanoCenter. The PowerMEMS 2009 conference was chaired by ISR Director Reza Ghodssi (ECE/ISR). 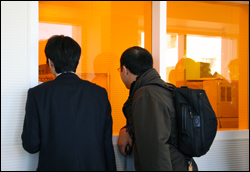 More than 180 visitors from all over the world attended the conference, from universities like Tokyo University, Tohoku University, Seoul National University, Stanford, MIT, UC-Berkeley, Georgia Institute of Technology, Imperial College London, EPFL, Freiburg University and more.